A NIMS-Osaka University collaborative research team created a mesh that can be wrapped around injured peripheral nerves to help their regeneration and repair their functions. The research team comprised of Mitsuhiro Ebara, MANA associate principal investigator, Mechanobiology Group, NIMS, and Hiroyuki Tanaka, assistant professor, Orthopedic Surgery, Osaka University Graduate School of Medicine. 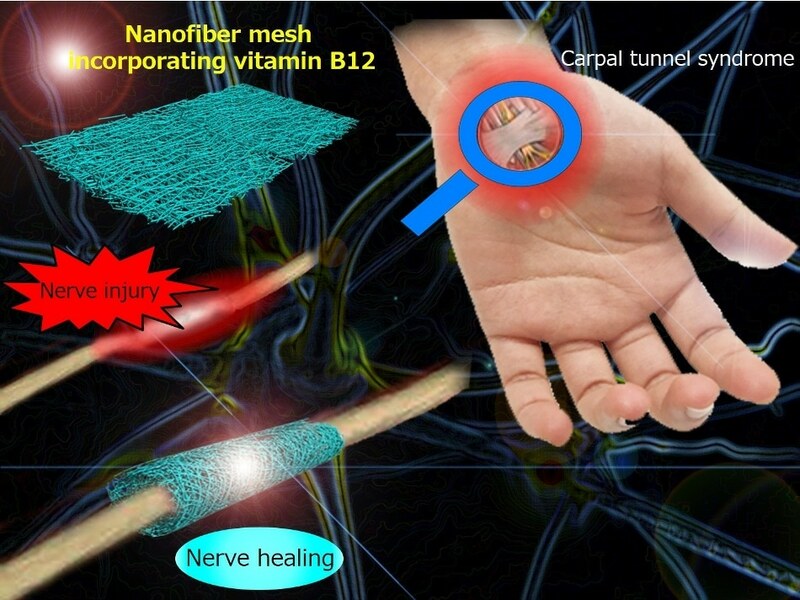 This new mesh incorporates vitamin B12 - a substance crucial to the regular functioning of nervous systems - which is extremely soft and degrades in the body. The mesh was tested on injured sciatic nerves in rats, and was found to promote nerve regeneration and recovery of their sensory and motor functions. The team is currently considering clinical application of the mesh to treat peripheral nerve disorders such as carpal tunnel syndrome (CTS). In the past, artificial nerve conduits have been created to treat peripheral nerve injuries, but they simply form a cross-link to the injury site and do not facilitate faster regeneration of the nerve. Furthermore, their application is restricted to relatively few patients suffering from a total loss of nerve continuity. Vitamin B12 has been known to promote nerve regeneration, but oral administration of it has not been proven to be very effective. Plus, there are no devices that can deliver vitamin B12 directly to affected areas. Therefore, researchers are keen to develop such medical devices to actively facilitate nerve regeneration in numerous patients who suffer from nerve injuries but have not lost nerve continuity. The special mesh created by the NIMS-Osaka University joint research team recently can be wrapped around an injured nerve. It then discharges vitamin B12 (methylcobalamin) until the injury heals. By creating very fine mesh fibers measuring just several hundred nanometers in diameter, and decreasing the crystallinity of the fibers, the team effectively designed a very soft mesh that can be wrapped around a nerve. This mesh is produced with a biodegradable plastic which, when implanted in animals, is ultimately eliminated from the body. In reality, experiments showed that application of the mesh directly to injured sciatic nerves in rats caused the regeneration of axons and recovery of sensory and motor functions within six weeks. The team is currently in talks with a pharmaceutical company and other organizations to jointly examine clinical application of the mesh as a medical device to cure peripheral nerve disorders, such as CTS. This research was supported by the JSPS KAKENHI program and AMED’s Project for Japan Translational and Clinical Research Core Centers (also called as Translational Research Network Program). The details of this research were published online in Acta Biomaterialia.